Scarlett Johansson’s engagement ring from journalist Romain Dauriac is an exquisite one. The vintage ring is a lovely example of Art Deco style, with three round diamonds surrounded by a magnificent rectangular setting. Like Scarlett Johansson’s engagement ring, this stunning custom ring from Brilliance features incredible details that give a nod to Art Deco Style. This vintage-inspired piece has a 1.02-carat cushion-cut diamond at its center, along with numerous accent stones totaling an additional 1.20 carats that increase its sparkle as well as its unique, artistic appeal. While this particular ring is set in white gold, one like it would look equally incredible in platinum, palladium, yellow gold, or rose gold. Born November 22, 1984, Scarlett Johansson is a well-known American actress as well as a model and singer. She made her film debut in 1994’s North, and in 1996, she was nominated for the Independent Spirit Award for Best Female Lead for her role in Manny & Lo. Scarlett gained additional fame via her roles in 1998’s The Horse Whisperer and 2001’s Ghost World. 2003 saw Scarlett shift to adult roles with performances in Girl with a Pearl Earring and Lost in Translation. She earned Golden Globe Award nominations for both films and won a BAFTA award for Best Actress in a Leading Role for Lost in Translation. Johansson earned two additional Golden Globe Award nominations for roles in 2004’s A Love Song for Bobby and 2005’s Match Point. Subsequent performances included parts in The Island, The Black Dahlia, The Prestige, The Other Boleyn Girl, Vicky Cristina Barcelona, and He’s Just Not That Into You. Scarlett has played the part of Marvel comic book character Black Widow (Natasha Romanoff) in several films including Iron Man 2, The Avengers, and Captain America: The Winter Soldier. She will play the part again in 2015’s Avengers: Age of Ultron. These are just a few of Scarlett Johansson’s most notable film performances, and she has appeared in Broadway performances as well. She won the Tony Award for Best Performance by a Featured Actress in a Play for her role in the 2010 Broadway revival of Arthur Miller’s play, A View From the Bridge. Scarlett received a star on Hollywood’s Walk of Fame in 2012. It is located in front of Madame Tussauds Hollywood wax museum at 6931 Hollywood Boulevard. Did you know that Scarlett Johansson celebrates what she describes as a “little of both” Christmas and Hanukkah. She has described herself as Jewish, with a number of ancestors who were of Jewish descent. Scarlett and French journalist Romain Dauriac began dating in November of 2012 and confirmed their engagement in September of 2013. In March of 2014, the couple confirmed that they were expecting a child. Their daughter, Rose, was born in September of 2014, and Scarlett and Romain were wed the following month at a private ceremony in Philipsburg, Montana. What Our Experts Have to Say about Scarlett Johansson’s Engagement Ring. Scarlett Johansson’s vintage engagement ring is one of a kind. Art Deco rings like it were created during the years between 1920 and 1935, and were highly influenced by the overall style of the roaring ‘20s, which can be seen in architecture, art, furniture, and other objects. This particular ring has three sizeable round diamonds at its center, plus it has a number of additional diamonds that add sparkle to the rectangular setting. 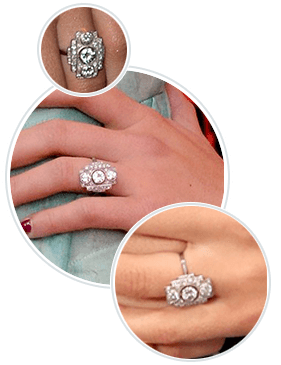 A unique antique engagement ring like Scarlett Johansson’s is of extreme value. It is impossible to provide a cost estimate without provenance and exact details which Scarlett and Romain have chosen to keep private. While an antique engagement ring with large, hand-cut stones carries a high price tag, a vintage-inspired ring that takes inspiration from Scarlett Johansson’s can be affordable when you work with Brilliance. Using our fun, interactive online design tools, you can collaborate with our diamond experts to create an exact replica of Scarlett’s engagement ring or design a completely custom, vintage-inspired ring of your own. Suit your style as well as your budget by working with Brilliance. We bring sparkle into your life without Hollywood price tags.